With the Dark Millennium MMO on the horizon, THQ isn't sure there's room for a Space Marine sequel. The first third-person action game set in the Warhammer 40K universe has done pretty well at retail, but Space Marine hasn't been an all-out success. Given that sales have been moderate, THQ spokesperson Danny Bilson isn't sure there is room on the company's calendar to invest in making Space Marine 2. THQ will continue to support the game with DLC, but Bilson thinks that another game so soon would conflict with the planned release of Dark Millenium, another Warhammer 40K MMO, in 2013. Bilson did say that the company extended the license with Games Workshop for many years to come, so fans can expect more games in the setting. We just don't know what kind of game. Bilson wouldn't give specific sales numbers, but said that Space Marine was "doing okay" and not great. "It's a really good game, it's doing pretty well," said Bilson. "In this world, honestly, you have to do exceptionally well to make any money, because the games are so expensive." Still, Space Marine 2 may be too similar to Dark Millenium's planned gameplay and use of the setting. "We've already announced the Imperium in the MMO as a class you can play," he said. "If you combine that it's very active, as opposed to the more turn-based stuff. I'm not sure there's room for Space Marine." That doesn't mean fans of WH40K won't have other games to play from THQ. "We are heavily invested in the 40K universe, so there's more stuff coming in the 40K universe, absolutely. We extended the deal for quite a while," said Bilson. But if one game will get in the way of the MMO release in 2013, wouldn't another game too? 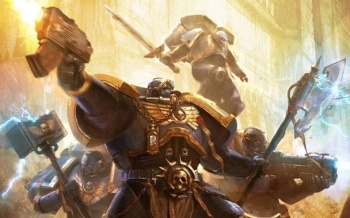 Perhaps the conflict is just in the gameplay, so a Warhammer 40K game in a different genre might be possible before 2013. I know what you're thinking. I don't see how an MMO and an third person shooter conflict in terms of gameplay either. Oh well, Bilson may just be trying to explain away the fact that Space Marine ain't selling so there's no way in the seven hecks he's going to spend money on a sequel.